Owen Farrell's late penalty snatched a 12-11 victory for injury-hit England in their opening November international as sloppy South Africa were left to rue a lack of ruthlessness at Twickenham. The Springboks, driven on by a far more experienced pack, dominated the first half but only had a S'busiso Nkosi try and Handre Pollard penalty to show for it. England were fortunate to only be 8-6 down at the break after taking a battering from the South Africa forwards, Farrell on target with two penalties after Maro Itoje was sin-binned. The Red Rose raised their game in the second half to gain revenge for a 2-1 series defeat in June, Elliot Daly scoring a magnificent long-range penalty and Farrell splitting the posts eight minutes from time after missing an earlier opportunity. Pollard booted South Africa, missing key men with the Test falling outside the official international window, into an early lead after Kyle Sinckler strayed offside and England were a man down with 15 minutes played when Itoje was shown a yellow card. Itoje produced a brilliant try-saving tackle after Nkosi rose above Daly to take a magnificent catch from a towering Pollard kick, but the British and Irish Lions forward was punished for not rolling away. 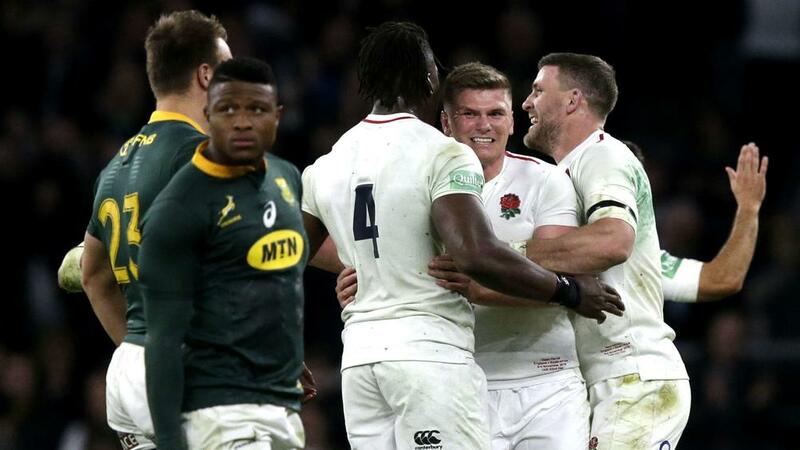 South Africa were well on top, but Malcolm Marx let England off the hook with a poor throw from a line-out and Farrell levelled expertly from the tee against the run of play before Itoje returned to the fray. South Africa ought to have had a healthy lead at the break, but Farrell's second penalty late in the first half reduced the deficit to two points. Eddie Jones made a change at half-time, sending Ben Moon on for a debut and hauling off Alec Hepburn, and there were further changes just after the interval, with Eben Etzebeth and Tom Curry limping off.